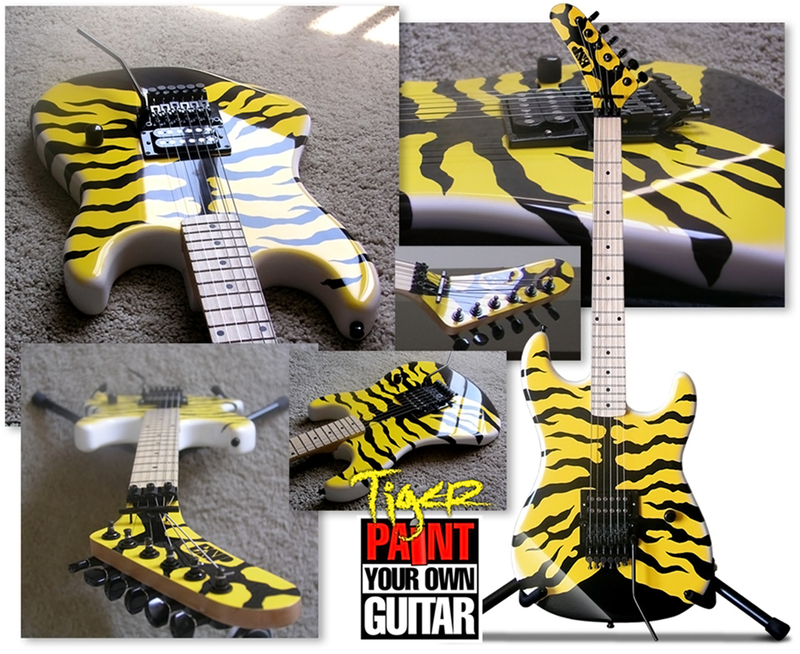 Paint Your Own Tiger | Welcome To Paint Your Own Guitar! The ‘PAINT YOUR OWN GUITAR’ Guitar Painting System Is Your Step-By-Step Blueprint To Guitar-Painting SUCCESS! PAINT YOUR OWN GUITAR’s, ‘HOW TO Paint & Wire Your Very Own TIGER‘ was written to teach you the PROPER way to paint a guitar, and to reduce, and even ELIMINATE, the learning curve. HOW TO Paint & Wire Your Very Own TIGER makes it a breeze to learn how to paint an accurate ‘TIGER’ replica – without any prior painting experience. Using our method, yours will looks as good as the original! PLUS: This e-book also details how to disassemble, assemble, and wire your guitar. On top of that, you’ll also learn how sunbursts are created! The Paint Your Own Guitar ‘Step-By-Step’ System takes ALL of the mystery and guesswork out of achieving what you never thought was possible. No stoned has been left unturned. THIS STEP-BY-STEP SYSTEM MAKES IT POSSIBLE. YOUR RESULTS WILL RIVAL THIS! Attempting to paint your own guitar can seem like a very daunting task. Although it’s not Rocket Science, there’s still a lot to know. That’s why many first-timers who attempt to paint their own guitar without the proper knowledge are destined to fail. The reason they fail is that there are many steps to successfully painting a guitar; miss or under-perform any one of those steps and your chances of success are unlikely. But, what if I told you that you could paint your own guitar, even if it’s your first attempt, and your finished guitar would blow you away? PAINT YOUR OWN GUITAR’s, ‘HOW TO Paint & Wire Your Very Own TIGER’ was designed to teach you the PROPER way to paint a guitar, and to reduce, and even ELIMINATE, the learning curve. Instead of making every mistake possible – which is completely natural when learning something you’re not familiar with, this book gets you past the learning curve of painting guitars and puts YOU right where you want to be. And, that’s – producing KILLER FACTORY-LIKE GUITAR FINISHES. 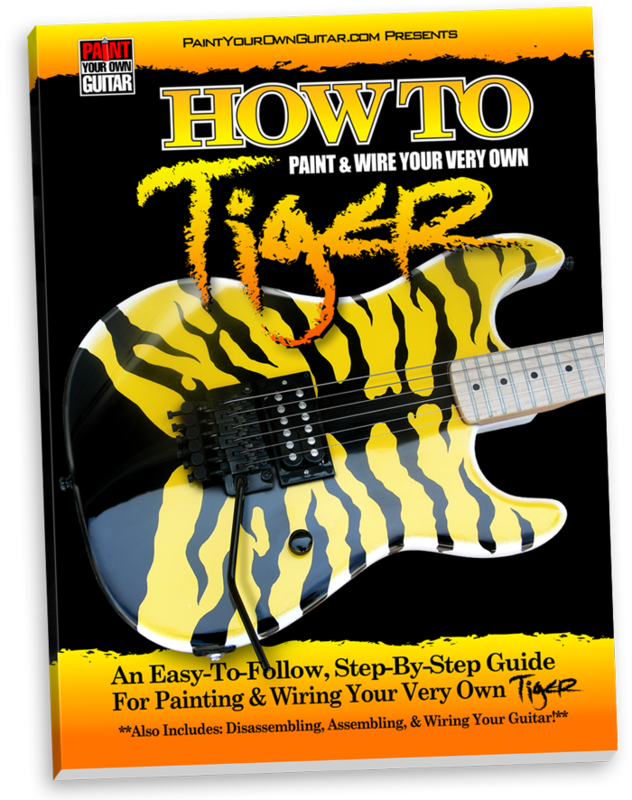 ‘HOW TO Paint & Wire Your Very Own TIGER‘ is an easy-to-follow, step-by-step method that educates you, and gives you the confidence and skill to be able to produce stunning factory-like guitar finishes – all without using ANY expensive equipment. You’re doing it with SPRAY CANS. The PAINT YOUR OWN GUITAR Book Series takes ALL of the mystery and guesswork out of achieving what you never thought was possible. No stoned has been left unturned. Which Types Of Spray Cans Are The BEST – The paint industry has changed dramatically since this book was first introduced. What was available even a year ago is no longer available. We’ll show you what your options are and what works best and why. We’ll also tell you what to stay away from. Prepping The Body – This step will make or break your paint work every time. The better you prep your body for painting, the better the finished product will look. I’ll show you exactly how to accomplish a professional job with just a few store-bought items. Masking Products – I’ll show you the BEST products available for masking your body, as well as what NOT to use. Using the products I recommend will guarantee clean, crisp lines EVERYTIME… and NO tape residue! Proper Painting Technique – Using the PAINT YOUR OWN GUITAR painting method, you’re likely NEVER to get another paint run again! How To Get That Thick, Glossy Finish – Although it may seem impossible if you’ve had no prior painting experience, it’s not. I take ALL of the guesswork out of achieving a thick glossy finish and show you just how easy it is to obtain it! Over 230 full-color photos and illustrations detailing the designing and painting of a Bengal Tiger design. Simple, easy-to-follow, step-by-step instructions on how to do everything PROPERLY. Over 120 POWER-PACKED pages of rock-solid content… and not a paragraph of filler or fluff. Thousands of customers have already painted their DREAM GUITAR! WILL YOU BE NEXT?? WHAT ELSE DO YOU GET WHEN YOU PURCHASE THE PAINT YOUR OWN GUITAR SYSTEM? “You get IMMEDIATE access to 120+ minutes of online video footage covering many of the techniques I use in the books as well as things that are NOT covered in the books – such as assembling, disassembling, wiring shortcuts and more. ORDER TODAY, and I will include my e-book, ‘The Finish Protector™’, FREE! DON’T MAKE THE MISTAKE OF PLACING A NEWLY LACQUERED GUITAR ON A GUITAR STAND WITH RUBBER ARMS – BECAUSE LACQUER AND RUBBER DO NOT MIX. RUBBER EATS LACQUER – ALL FORMS OF LACQUER INCLUDING NITROCELLULOSE LACQUER! 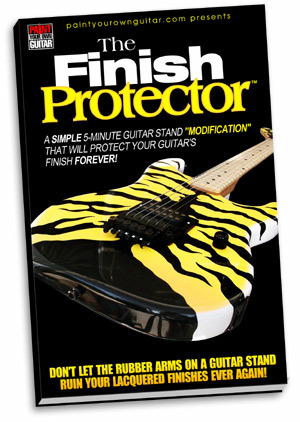 This book will show you how to modify a guitar stand in about 5 minutes so that your guitar finish (if you painted it with lacquer) will stay protected FOREVER – and you’ll never have to worry about any sort of damage happening to ANY of your guitars’ finishes. 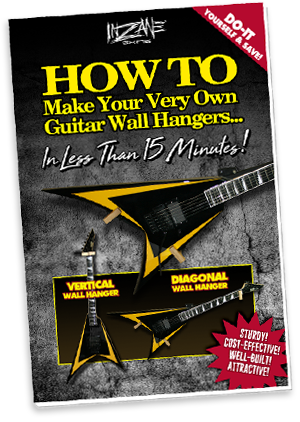 ORDER TODAY, and I will include my e-book, ‘HOW TO Make Your Very Own Guitar Wall Hangers’, FREE! Forget about spending $50 or more for commercial Diagonal Guitar Wall Hangers. I’ll show you step-by-step how I make my own guitar wall hangers for less than $7.00 each! I also show you how to make a Vertical Guitar Wall Hanger, too. 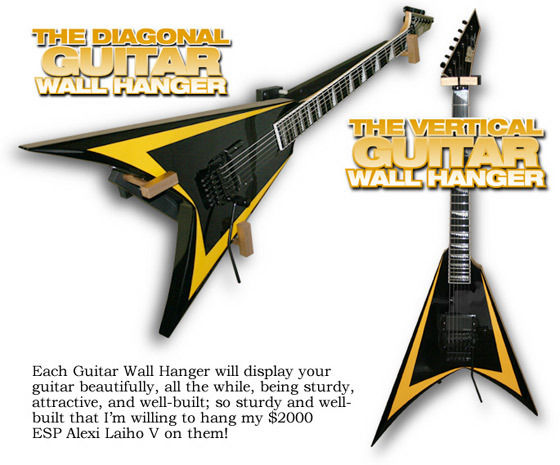 These wall hangers are so easy to make, and yet, well-made, I am willing to hang my $2000 ESP Alexi Laiho V on them! WITH THE MONEY YOU’LL SAVE NOT HAVING TO BUY COMMERCIAL GUITAR WALL HANGERS, YOU CAN SPEND IT ON ANOTHER GUITAR TO PAINT! 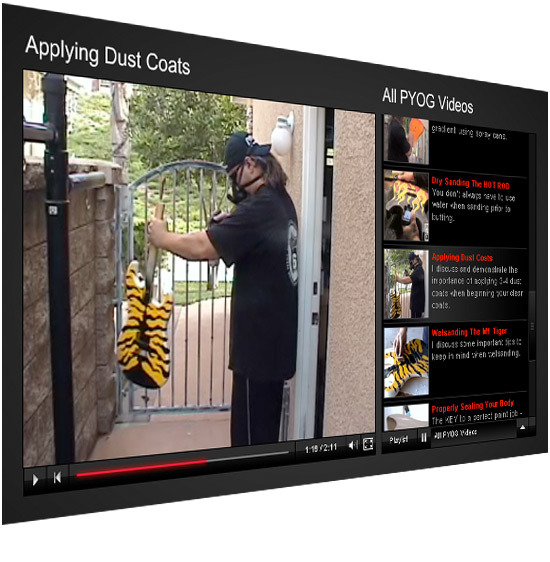 You’ll get access to the PYOG Newsletter Library which contains loads of additional information on topics such as: painting, prepping, assembling, disassembling, wiring, updates on products, Q&As, and so much more. Plus, every month PYOG will deliver a new newsletter containing additional information – sometimes, not addressed in the books. Access to the newsletter library is valued at $297, but is yours FREE when you purchase the PAINT YOUR OWN GUITAR Step-By-Step Guitar-Painting System. 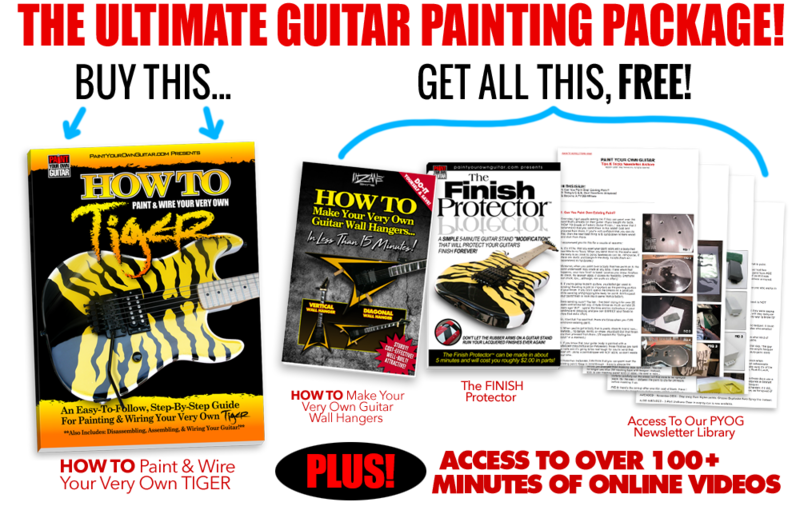 Make your first step into the world of painting guitars the RIGHT STEP by purchasing ‘HOW TO Paint & Wire Your Very Own TIGER’, and get these invaluable bonus items. It is literally the BEST GUITAR-PAINTING investment you will ever make. John Gleneicki has been painting guitars professionally for over 25 years. He’s a former Guitar WORLD Columnist and has also done custom airbrush work for such notable companies as ESP Guitars. P.S. Remember you get access to over 100+ minutes of online video clips FREE when you order ‘HOW TO Paint & Wire Your Very Own TIGER’ today. P.P.S. If you want to take a quantum leap toward guitar-painting success, you need to try out my “Easy-To-Follow, Step-By-Step System’ now! You’ll be taught the exact same techniques I’ve used successfully for over 25 years!